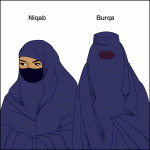 On Tuesday 14th September 2010, The French Assembly finally voted in favour of banning burqas and other full-body robes worn by women in all public places. This means that anyone wearing the burqa in public could now face a fine of 150 euros (£120) and be asked to attend courses on what the government calls "republican values." In addition, any person forcing a woman to wear a burqa or a niqab could face a year in jail or a 30,000 euros (£25,000) fine. The controversial law, however, will only be put into action six months after its promulgation, pending approval from the French constitutional council. Such a delay could facilitate a dialogue with the 2,000 or so women currently wearing niqabs and burqas in France, a dialogue which might be rather one side given that both the Parliamentary Assembly of the Council of Europe and Amnesty International have already harshly criticized the bill for 'infringing the freedom of expression and religion for women'. Moreover, some Muslim associations and countries have condemned this stigmatization of their religion. This is not a law that will be easily accepted by the public. What are your thoughts on the new law? Loi inutile (concerne 0.000001% de la population) et stigmatisante. Il existe déjà une loi qui interdit de cacher son visage en public sauf jour de carnaval (si mes souvenirs sont bons). Il suffit de faire appliquer cette loi dans les lieux publics. What happens if the woman wants to wear one? I think thats the problem. Many of these women are French natives who convert to Islam and take pride in wearing the Niqab.